Fast delivery, well packaged and Excellent item - really pleased - MANY THANKS. Arrived in a hard case to prevent any damage in the post which is good. No written instructions but a few pictures show how to fit the screen protector, it's quite easy to do. The screen protector itself has cut outs in the right places and is the right shape for my S6. It doesn't stick all the way to the edges though and it's easy to see a border all around the edge of the screen protector where it isn't stuck down. Considering the price, 99p for two, I can't really complain about this minor issue. Overall it is stuck to the screen and will protect it from damage without effecting the touch screen performance. This item does exactly what you would expect it to do, it's easy to put on your phone and it's easy to make sure there are no air bubbles. Unfortunately it's quite delicate when not attached to a phone, so it is quite easy to break before they are fitted. However, it's tough as old boots when fitted. I've dropped my phone twice with it attached, only the second time did the screen protector break, which is very impressive. Overall, for the money, this is the best you can buy. Highly recommend. Overview: The glass was pressing too tight against the screen but not holding onto the phone's body well enough to provide adequate protection. In this case we ended up taking it off, snapping the glass in the process. WOULD NOT RECOMMEND TO ANYONE WHO VALUES THEIR SCREEN. 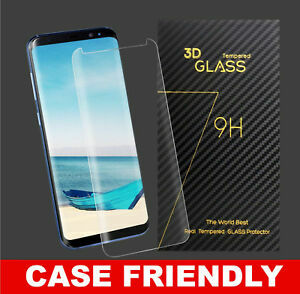 Pros: - It is quite a thick tempered glass so should protect the screen decently well from scratches - Comes with cleaning kit consisting of 1 wet and 1 dry wipe Cons: - The sticky adhesive on the sides couldn't grab onto the phone leaving the tempered glass held on by the top and bottom flat surfaces of the phone and able to be pulled off even though the glass was correctly aligned with the phone - The tempered glass was pressuring the screen to the point where it looked like the screen had an oil spill on it which spread into smaller oil spills as you tried to use the phone - The glass didn't fully cover the screen leaving the curved sides with a few millimeters either side exposed. A case would be needed to provide that loss of protection but would also need to cut off a tiny part of the screen doing so.